February 28, 2011  Brazilian police are questioning a man who drove his car through a crowd of dozens of bicyclists, injuring at least 16 riders who were taking part in a Critical Mass ride to raise awareness of cyclists. 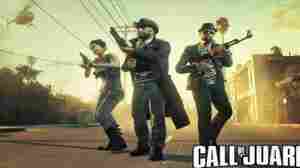 February 23, 2011  A soon-to-be-released video game — Call of Juarez: The Cartel — that glorifies murder and mayhem in the violence-wracked city of Juarez, Mexico, is sparking an outcry. Critics on the border say it's in bad taste given the thousands of people killed in the city's drug wars over the past few years. February 18, 2011  The killing of an Immigration and Customs Enforcement agent in Mexico on Tuesday and an incident involving another in San Antonio on Jan. 13 have left agents shaken and wondering if ICE is adequately protecting them in an increasingly violent criminal environment. February 17, 2011  A genetic mutation in a population in Ecuador seems to prevent diabetes and ward off cancer. It's also responsible for their short stature: most are under 4 feet tall. February 17, 2011  Eight South American countries have recognized Palestine as an independent state since December, giving the Palestinian Authority momentum in a campaign to win support worldwide. 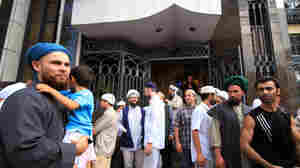 One of the first was Argentina, home to Latin America's largest Jewish community. The decision has sparked both praise and censure. February 15, 2011  An American jailed in Cuba is accused of acting on a U.S. plot to destabilize the Caribbean nation by spreading access to the Internet. U.S. officials insist the 61-year-old Maryland resident's activities were a harmless attempt to improve Internet access for the island's small Jewish community. February 15, 2011  A judge in Ecuador has ordered Chevron to pay $9.5 billion in damages and cleanup costs. The court ruled the oil giant was responsible for contaminating a large swath of Amazonian jungle. Chevron said it will appeal. February 11, 2011  So far Chilean emergency authorities say no damage has been reported. February 9, 2011  This is the time of year when millions of monarch butterflies gather in several forests in central Mexico. Local officials have tried to market the Monarch butterflies migration as a tourist attraction but their winter reserve happens to be in a state hard hit by Mexico's drug war. February 8, 2011  A woman in Santiago, Chile, was distraught that her man was going away. He boarded a plane bound for Spain for a job as a cruise ship waiter. Grace Guajardo says she couldn't stand to see him leave, so she phoned in a bomb threat that forced everybody off. He decided not to get back on the plane. 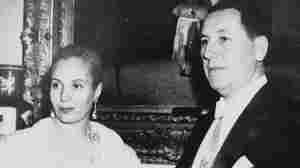 February 8, 2011  Decades after iconic Argentine leader Juan Peron's death, his personal belongings are housed not in a museum, but in a Buenos Aires apartment. It belongs to a former Peron aide who now wants to auction off the 14,000 items online. February 4, 2011  The government in Bolivia has come up with a novel use for decommissioned coca leaves. It's using the leaves as fertilizer. The government hopes it will deprive drug traffickers of coca's raw material for making cocaine. 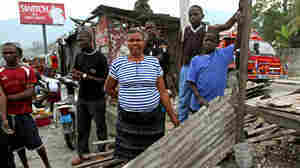 February 1, 2011  Haiti's earthquake left more than 1 million people homeless. Roughly 1,000 of those in need of shelter created a place to live on an 8-foot-wide highway median. More than a year after the disaster, the people living in that camp are being moved out of the traffic. January 31, 2011  Every year, the Colombian bull festival known as Corralejas draws thousands of spectators and hundreds of participants. 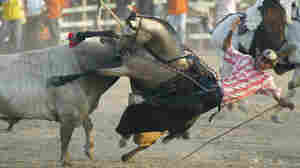 Although these bullfights are dangerous, for both the men and the bulls, they are embedded into Colombian culture, reflecting the country's rigid hierarchy between rich and poor. January 30, 2011  The systems have the potential to let Haitians receive remittances from abroad, send cash to relatives across the country, buy groceries or pay for a bus ride with a few taps of their fingers.